The third (and final) piece I wrote for Rolling Stone to accompany the launch of their Kim Kardashian cover (July 2015) was this list of references to the Kardashians in hip hop, co-written with Brittany Spanos and Nick Murray. Below are the pieces I wrote from the list, which you can read in full here. Published on Rolling Stone, 14 July, 2015. Published on Rolling Stone, 2 July, 2015. Even more than ideas of race, power and ego, the motivating force in Kanye West's decade-long career has been fear. Six years after his infamous outburst at the VMAs, Kanye appeared on the Grammys stage earlier this year to show everyone just how far he'd come since the night he learned that speaking his mind could make him lose everything. In 2009, a Hennessy-soaked Kanye declared to the world that Taylor Swift was less deserving of her Best Video award, that Beyoncé should've won instead. In that single moment, he was exiled from the worlds of music, fashion and celebrity—areas of culture he'd spent his life up until that point striving to inhabit. 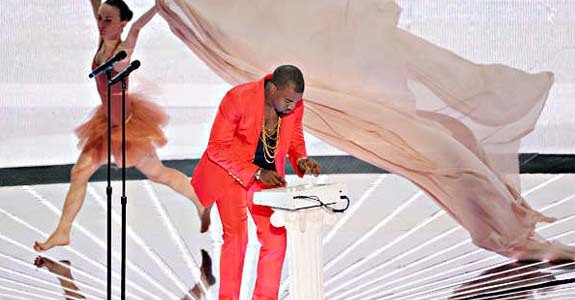 While this was the most famous instance, it was by no means the only time Kanye lost something precious to him.